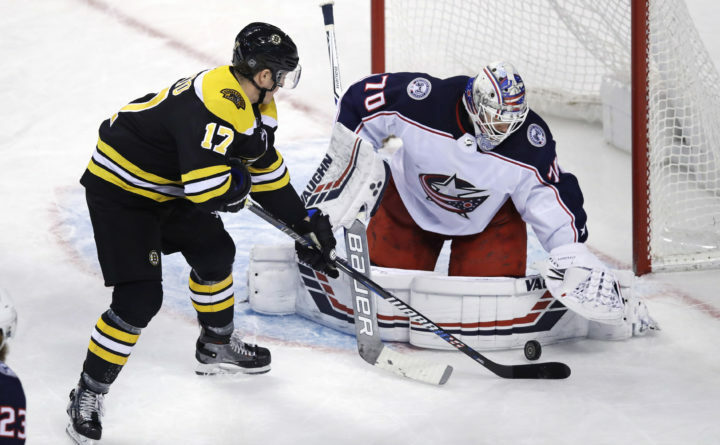 Boston Bruins forward Ryan Donato tries to backhand the puck past Columbus Blue Jackets goaltender Joonas Korpisalo, who makes the save, during the first period of their game in Boston on Monday night. BOSTON — Cam Atkinson scored 2:55 into overtime to lift the Columbus Blue Jackets to a 5-4 victory over Boston on Monday night for their eighth straight victory, spoiling a splendid NHL debut for Bruins forward Ryan Donato. Sonny Milano, Boone Jenner, Thomas Vanek and Artemi Panarin also scored for the Blue Jackets. Nick Foligno had two assists, and Vanek and Jenner each added one. Joonas Korpisalo stopped 34 shots. Just 25 seconds after Nash had give the Bruins a 3-1 lead, Milano redirected Ryan Murray’s slap-pass from the right point to pull Columbus within one with just over three minutes remaining in the middle period. Jenner got Columbus on the scoreboard first when he redirected Vanek’s pass by Rask 4:15 into the game. Nash’s power-play goal increased it to 3-1 as he banged home a rebound from the top of the crease with 3:28 remaining.